Rita Hepner reads the biography the students wrote about her after they interviewed her on a previous visit. Photos by Jo Mathis. 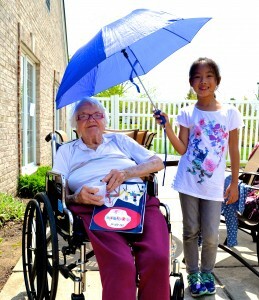 Rita Hepner was one of about a dozen older residents who had sat patiently on the patio of Clare Bridge Memory Care facility in Ann Arbor one recent sunny afternoon waiting for the busload of A2STEAM @ Northside third graders to show up. Within minutes, each elder was listening to his or her biography written by the students who have visited them several times. A2STEAM third grade teacher Rachel Toon was inspired to create the Biography Project after listening to Nell Duke, author of “Reading and Writing Genre With Purpose,” at a conference at Hillsdale College two years ago. 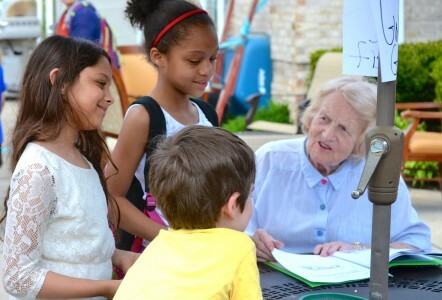 She first tried the project last year at Bryant Elementary with her second graders, after connecting with Clare Bridge because the facility specializes in memory care. Toon says that the elderly in America are often feared or regarded with revulsion by young people. “This can be changed through personal connection with the elderly,” she said. Gertrude Fehr gets some relief from the sun. While teaching them about Alzheimer’s and memory loss, Toon hopes the students understand the urgent need for preserving memories. “And what better purpose to learn how to write an effective biography?” she asked. Ebony Adams, the activities coordinator at Clare Bridge, was excited by the idea. Gwen Gilbert talks about the biography the students had just read to her. Moving to A2STEAM this year allowed Toon and her third grade team colleague Nate Hattto to take this project to the fullest potential. 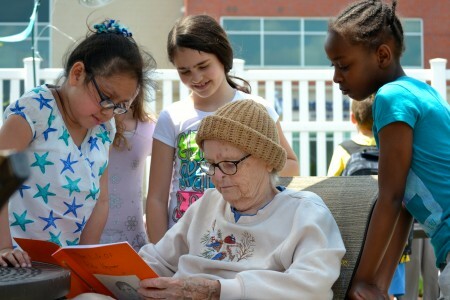 “Using Duke’s model of teaching reading and writing, plus the Buck Institute of Education’s model for Project Based Learning, my students this year had a robust framework to learn and the urgency and agency to create a real-world product,” she said, noting that she invented the word “elderbuddies” to capture to relationship she hoped would form between the generations. Andrea Wilkerson, whose daughter, Chelsea, is one of the third graders, believes the program has been a great way to get the kids out in the community. That’s My Girl! You Go Rachel! So grateful that my mom Rita Hepner could participate in this. 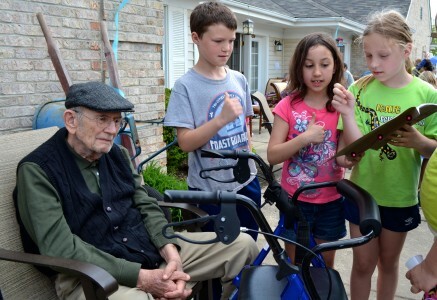 Wonderful caring project! Thank you!! Ms. Toon, I’m so happy to see that this story was printed for our greater A2 community to be inspired! I was inspired about this idea when you shared with me in the STEAM AV room while making copies! 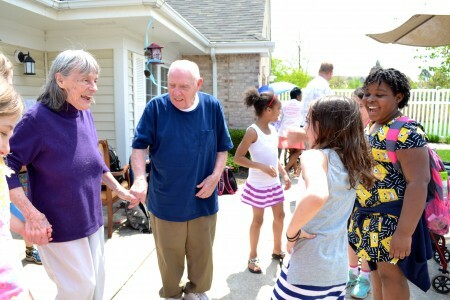 What a wonderful experience for the kids and their Elderbuddies. I would love to see this project reach all schools in Ann Arbor.